We’d love your help. Let us know what’s wrong with this preview of The Visual Dictionary of Military Uniforms by Deni Brown. To ask other readers questions about The Visual Dictionary of Military Uniforms, please sign up. Dorling Kindersley, Inc. (1992). The visual dictionary of military uniforms. New York, NY: Dorling Kindersley. Content/Scope: This book is full of labeled illustrations to show parts of military uniforms, complete with explanatory text. The book features uniforms used from ancient Rome to the twentieth century. The book is recommended for ages 9-12. Accuracy/Authority/Bias: Published by Dorling Kindersley, the book has Dorling Kindersley, Inc. (1992). 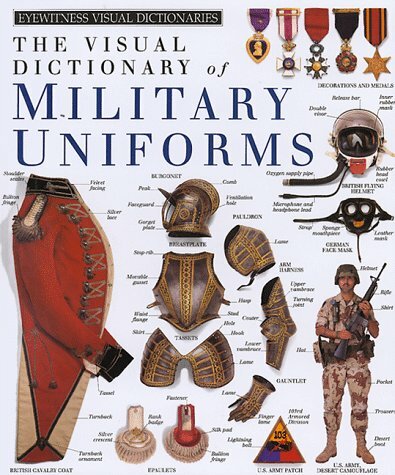 The visual dictionary of military uniforms. New York, NY: Dorling Kindersley. Accuracy/Authority/Bias: Published by Dorling Kindersley, the book has received positive reviews about its introduction into world military uniform history. However, there have been a few minor errors published. DK Publishing is world renowned for highly visual books that inform readers. Arrangement/Presentation: The 64-page hardback book features a table of contents and index. Relation to Similar Works: This is a book included in the My First Look At Series. Timeliness and Permanence: There has not been a similar book published since 1992. While most of the information is still relevant, some errors have been found. Accessibility/Diversity: This book is available in only hardback. It features military uniforms from around the world. The highlight for me was the beautifully preserved Royal Flying Corps aviator uniform and cold-weather flying gear from the 1910s, but there's a lot more worth looking at here.